We all have New York City stories. Tales about our subway troubles or the rude people you encounter or that awful apartment. Our experience with this city garners a love-hate relationship. That’s the jumping off point for Amelia Parenteau’s Liminal. Callinda serves as the central mouthpiece that makes her story sound like ours. On her enchanted journey through New York City, we see her date a guy, make friends with a homeless man, and encounter a Greek Chorus of homegrown denizens. From monologues to a series of scenes, Parenteau’s script is a mixed bag. The story is not distinctive and filled with clichés. Many of the conversations that Calli Girl, as she gets nicknamed, and her array of pals discuss are those typical party chats you’ve heard countless times before. Callinda is a very basic character. Her stories are trite. It’s inevitable that Callinda will resonate to people but what new information or inspiration does she bring? The strongest characters and best bits happened to come from the Greek Chorus. This was by far Parenteau’s strongest and brightest bits of writing. Not only are they intelligent and witty, the way they offer information with truth and sincere. You listened when they spoke. It’s hard to say the same with Callinda. 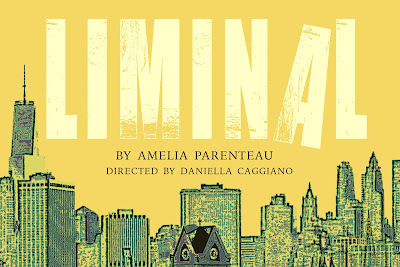 It’s possible that Liminal could have had a different narrative with a different actress in the role of Callinda. Rachel Belcanoff is a strong actor. She offered a Kimmy Schmidt naivety to the character. But the character was sadly grating. Additionally, she and Thomas Wood as Jake one note generic guy in New York had very little chemistry. It’s a wonder why Callinda would continue to see him. The highlights of the acting company came from Shashone Lambert, Vanessa Pereda-Felix, and Samantha Jane Williams as Jackie, Lisa, and Deirdre respectively. Raw and authentic is an understatement when it came to their performances. The way they interacted and used one another displayed great cohesiveness. The Greek Chorus was fresh and deserve their own piece. To tell this story, director Daniella Caggiano applied the smart rule of less is more. But the theater was just way too large for Caggiano’s vision. Not only did her actors have projection issues, there was so much empty space at all times. To try to fill the space, Caggiano literally littered it. It was the most accurate representation of New York in the entire production. She allowed a layer of whimsy in her staging, utilizing some off stage magic in certain scenes to break up the monotony. It was a great choice on Caggiano’s part to keep the action moving and have scene shifts occur at the tails of previous scenes and bleed into the next, but there were moments where the obnoxious stair units trumped the dialogue. Liminal had some strong choices and some strong messages to offer. But in a time where we’re all lamenting the same troubles and woes, it offered nothing new. As far as space is concerned, it’s unfortunate to have the card that Fringe dealt but finding a way to make it work is the magic of theater.